THE LEGACY OF CAMELOT RECORDS – one of Seattle's most fabled 1960s rock 'n' roll record companies – had, for far too long, seemed destined to fade into the mists of time.The saga behind Camelot – a label named after the glamorous castle of England's King Arthur and the home of his Knights of the Round Table – is a fascinating one. At core, it is the story of its owner, Jan Kurtis Skugstad, and his personal commitment to audio excellence. A native son of Norway, Skugstad (and his family) moved to the USA in 1947 and eventually settled in Seattle where he learned to play the drums in jazz, pop, and country bands. In addition, he did spent time in early Seattle recording studios doing sessions with the likes of Bonnie Guitar, the Fleetwoods, and the Ventures. Such experiences then led to a few years on the road – and Nashville- and Los Angeles-based hit-making sessions with many top names – before he returned home to Seattle in 1964.There is an olde English saying – "A man's home is his castle" – and it was in Skugstad's Wallingford neighborhood house that he built a home-studio: his very own Camelot. At that time the Northwest rock 'n' roll scene was boiling and a handful of studios were active – but none possessed the secret weapon that Camelot had: an engineer who was also a talented and highly experienced musician. Word quickly spread and a parade of young combos came clamoring to work with Skugstad and have their discs issued by Camelot Records. Included among them were the Notations, the Hallmarks, the Page Boys, the Young Men, the Deacons, the Agents 00, the Wellington Five, and the King's Men (not the "Louie Louie" boys from Portland). No matter what strains of rock 'n' roll Skugstad was cutting – classic Northwest teen-R&B, Go-Go dance music, funky Soul, post-Beatles pop, surfer/ hot-rod rock – he always applied his high production standards. However, many of Camelot's discs initially fell through the cracks commercially. Far from being due to song choice or sound quality, that fate was in part a result of Skugstad's freely admitted personal focus on production rather than promotion. Between 1964 and 1966 Skugstad produced a rather prolific 50+ singles and a half-dozen LPs – in hindsight, perhaps too many for a one-man operation to effectively promote. Especially considering that a sizeable percentage of those were R&B-oriented tunes that traditionally met with little support from the Northwest radio industry. And whereas other successful Northwest labels – like Dolton, Jerden, Seafair, Bolo, and Etiquette Records – each put a great deal of effort into winning the support of powerful area radio DJs, Camelot refrained from getting too far into that courting ritual. Still, Skugstad did score significant commercial successes along the way: for example, Ron Buford's classic number, "Deep Soul," became the label's all-time biggest seller (moving many thousands of units, but mainly in radio markets in places like California and Texas where the demand for straight R&B was greater than Seattle). Then there was the Dorsals & Gatormen's 1965 rock 'n' roll tribute to Seattle's famously captured Killer Whale, "Namu," also did incredibly well on Northwest radio. But beyond those winners, Camelot was also the home to many other gems including more fabulously soulful discs cut by teen-R&B groups (mainly with African-American singers and/or players) including: bands led by Dave Holden and Ural Thomas, and the Statics with Tiny Tony, the El Caminos with Woody Carr, Jimmy Pipkin & the Boss Five, Larry Lee & the Leesures, and Mr. Clean & the Cleaners. And if these were foolishly overlooked at the time, they are today, all recognized as highly prized discs in the global record collectors' realm. 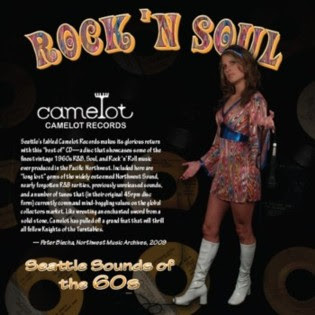 Camelot Sound Studios was moved a couple times in those early years: first to an old auto-shop/warehouse a few miles up at 10905 Aurora Avenue North -- and later even further northward to a large garage at 20707 60th West, in Lynnwood. And if the construction of those new studio facilities didn't keep Skugstad busy enough, he also carried on as a first-call drummer, and as a remote-location engineer who was skilled at cutting live performances. In the latter occupation he engineered Ernest Tubb & the Texas Troubadour's excellent 1965 show at the Spanish Castle Ballroom (which was released on CD by Rhino Records in 1992), and the jazz icon, John Coltrane's band's performance at Seattle's Penthouse (which was released by Impulse Records as the Live In Seattle LP). In addition to running Camelot, Skugstad also launched an entire family of labels to broaden the musical field, including: a second rock label (Quest Records, which was the earliest home of Merrilee Rush & the Turnabouts), a pop label (Nordic Records), and a fine country/western label (Spur Records). In the years hence, Skugstad progressed to other activities – today he works out of Paradise Sound Recording studios and Camelot Media is involved in many audio and video productions. Though its vintage catalog was officially out-of-print for four long decades, with this "best of" CD release in 2009, the legend of Camelot is finally resurrected.